We report a continuous-wave (CW) optical parametric oscillator (OPO) based on a MgO-doped periodically poled LiNbO3 (MgO:PPLN) crystal. The 532 nm pump generates coherent radiation that is tunable from 800 to 920 nm for the signal and from 1250 to 1580 nm for the idler, respectively. The OPO output power exhibits a slowly varying instability that we attribute to a thermal effect induced by the pump. This instability is truncated by means of a low-pass servo that includes a single-mode fiber that filters the beam into a single spatial mode. 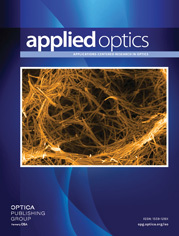 The resulting output characteristics are promising for radiometric applications in the near infrared including most fiber-optic communication bands.